Morris A. (Moe) Cannon was my Father. I decided on this Fathers Day to look up more information on my Dad's war experience. He was part of the HALPRO mission that was originally supposed to bomb Japan out of an airstrip in China. By the time his group was trained and ready to go, the Japanese had over run the airstrip they were to use and the Brits. had their hands full in North Africa, so Dad's group the 376th was sent to Bengazi. Dad's plane commanded by C.O. Brown was shot down while bombing the Italian fleet. My Father was the only survivor of his crew. Dad swam in the Med. over three hours, was picked up by an Italian freighter and handed over to the Germans. He then spent 34 months as a POW in Germany in various stalags. All of Dad's crew was thought to have perished when the crew went down. Moe survived the POW camps, came home, got married and had two children, my Sister and I.
I served in the US Air Force from 1966 to 1970 and served as an In Flight Refueling Systems Technician. My last year of service was spent as a Staff Sergeant in the 4252nd Strategic Wing at Kadena Air Base on Okinawa. The 4252 was designated as a temporary group. A few months after I arrived, it was designated as a permanent wing and was designated the 376th Strategic Wing. My Father and I served in the same outfit one generation apart. Enclosed is the only picture available of my Dad's crew. My Father is in the bottom row, left side with his hand on his cheek. The pilot C.O. Brown in top row on the far right. The pilot's Mother Lettie Brown was a close family friend until her death at age 93. I have also enclosed a picture of the patch my Father wore and I wore. I can identify the crew members in my Dad's crew photo. 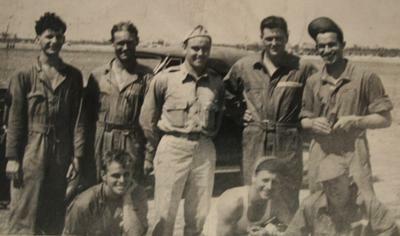 Left to right standing: Cutler, radio operator SSgt. Hazelet, Mech. SSgt. Anderson, Navigator 2nd.lt. Taylor, Co-Pilot 2nd.lt. Brown, pilot 2nd.Lt. Front row left to right. Morris Cannon (my Dad), Engineer/gunner SSgt. Thompson, gunner Cpl. Osgood, gunner Cpl. Thanks for the comment and I see that the photo was recently added under the Air Crews section . I'm grateful Mr. Cannon provided it to the website. Anderson is standing in the middle of the back row in the light uniform. Hello there, I'm doing quite a bit of research on Lt Malcolm Anderson who was the Bombardier-Navigator on this crew. This is the first crew photo I've ever seen and didn't think one existed. You've identified your father and Lt Brown in the photo, but could you shed some light on Lt Anderson's placement in the photo? I returned from NY about 10 days ago and went to the Long Island National Cemetery and viewed the burial card for Anderson at the cemetery. I'd like to email you for additional data regarding your Dad's crew. I also fly for the AF as a crew member. I look forward to your response.